Upon further investigation, we found that the story is a bit more complicated, at least when it comes to buying and selling property. According to various news reports, there has been a notable increase in interest in the Musashino daichi, or plateau, which covers parts of Western Tokyo and Western Saitama Prefecture. This is considered stable land, meaning no risk of liquefaction. The waterfront, of course, is all built on landfill, but there are many other areas located inland that suffered soggy ground after the Mar. 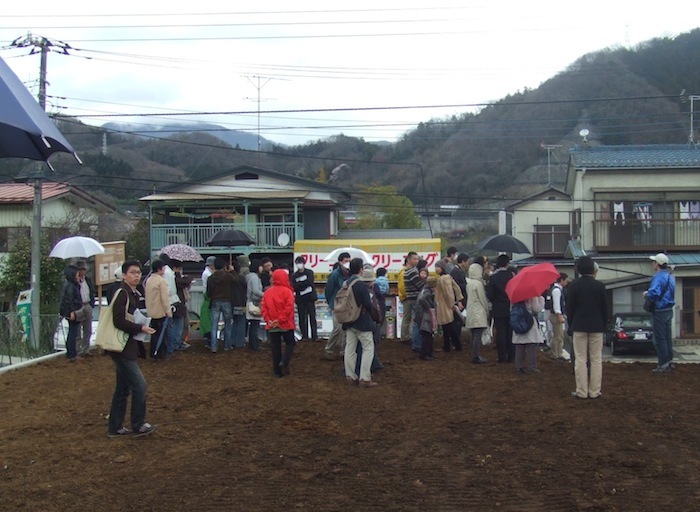 11 earthquake, such as Abiko in Chiba and Kuki in Eastern Saitama, communities that were built on ground that used to be swampland, rice paddies, or even ponds. Usually, you can determine the kind of land an area once was by consulting an old map. If the old name contains words that indicated water, like numa (marsh), then you might want to make sure your foundation is built on piles. In fact, a lot of developers change the names of such places so that people think they were built on solid rock (almost any subdivision with the word oka–hill–is a dead giveaway). The reason people wanted to live on the waterfront was its easy access to central Tokyo, but almost all the new condos out there are high-rises, which have become less popular since the earthquake. Also less popular is all-electric condos, which are problematic in times of rolling blackouts. Western Tokyo, which includes the Tama area, Tachikawa, Musashino, Kunitachi, and Kokubunji are only about a half hour from Shinjuku. But as one housing journalist told the news service J-Cast, Western Tokyo has always been popular, and while everybody is talking about condo owners on the waterfront hightailing it to higher ground, fewer are doing it than you might think. Mostly, the rumors are being fed by potential buyers, people who apparently don’t mind living in swaying buildings if they can get them cheap. But while there are many people who do want to sell, these people are under the impression that it’s now a buyers market, which means they’ll be expected to sell low. So they’ve decided to sit tight, hoping that the market will pass and they can get a little more for their places. It may be wishful thinking, but these owners paid a lot for their high-rises, and probably not that long ago. Many may think they won’t even be able to get enough to pay off what remains of their mortgage. If it’s any comfort, experts are saying that, because of the Tohoku disaster, there will be a shortage of new housing elsewhere in Japan because the bulk of new construction will be concentrated in the disaster area. What’s more, Tohoku was a center for the manufacture of building materials, and so the supply has been disrupted. Such a situation could keep prices of used housing relatively stable. The journalist interviewed by J-Cast recommends that if you’re thinking of buying a home, now is the best time, just make sure it’s on solid ground. You’d have to be mental to buy in Japan for the next half century! Demographics are crashing, used buildings are nearly worthless (which is why they are built like sheds – why invest more money in it) and there is an oversupply already, never mind builders going to the north. And of course there are the natural disasters, that you cannot get reliable insurance against. The only good news here is the negligible interest rate. Some specialist said on TV that this is only the begining for Japan, disasters may come every year or at least 2 years from now on, so why to buy land in Japan? I like that…”some specialist on tv said”. Stop the world, it’s time to get off.